This protein-packed, bacon-wrapped pork tenderloin with crispy, creamy potatoes and tender baked apples is simply to die for! This easy recipe makes two tenderloins; perfect for a party, or for having loads of leftovers to keep your family fed throughout the week. I like to make a big batch of the spice rub and keep in the pantry; it makes a great topping for oven-roasted salmon or even turkey. Tenderloin is unsurprisingly a tender cut of meat but wrapping it in bacon or prosciutto takes it to a whole new level of deliciousness! How Long do You Cook Pork Tenderloin at 350F? You should cook pork tenderloin at 350F (177C) for about 30 minutes or until the internal temperature reaches an internal temperature of 145F (63C) at the thickest part. Pork loin and tenderloin are different cuts or meat. The taste is similar but the size and cook times differ with tenderloin being the smaller cut of the two. For even bolder flavor, sprinkle the tenderloins with the spice mixture and refrigerate (uncovered) overnight. You can use bacon or prosciutto to wrap the tenderloin in. Bacon has a bolder flavor and more fat so it’s really a matter of personal taste. Adding sliced baby potatoes to the apples and onions takes this dish to a complete meal carbs and all! This protein pairs with so many things but I’m including links for a few of my favorites for you to try out. 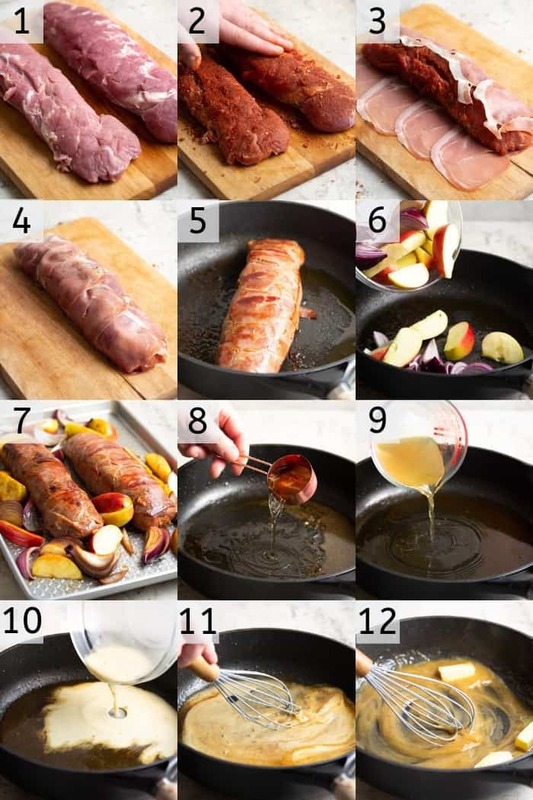 How Do You Make Bacon Wrapped Pork Tenderloin? Preheat oven to 350F. Get your ingredients out and place the tenderloins on a clean surface. In a small bowl, stir together salt, brown sugar, paprika, allspice, and orange zest. Sprinkle pork tenderloins evenly with spice mixture. Place four slices of prosciutto on a cutting board, overlapping slices slightly. Place one pork tenderloin in center of prosciutto slices; fold prosciutto up to wrap and cover tenderloin (prosciutto will stick to itself). Repeat with remaining tenderloin and prosciutto. You can definitely use bacon instead if prosciutto is not available or desired. Heat olive oil in a large skillet over medium high heat. Working one at a time, place wrapped tenderloins in skillet, seam side up. Sear until browned on all sides, 2 to 3 minutes per side. Place pork in a 13×9 baking dish. Sear apples and onions in skillet. Transfer to tenderloins, apples and onions to a baking dish. Bake until pork reaches desired degree of doneness, 25 to 30 minutes. Meanwhile, deglaze skillet with ¼ cup bourbon. Add ½ cup stock to pan. 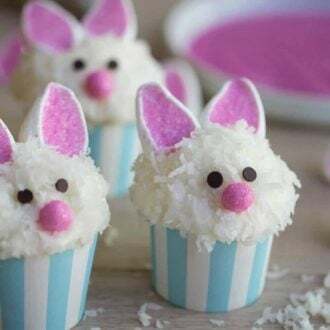 Whisk together remaining ½ cup stock and cornstarch in a small bowl or measuring cup. Whisk into mixture in skillet. Simmer until thickened, about 3 minutes. Stir in butter and remaining bourbon, if desired. Let pork stand 10 minutes; slice as desired, and sprinkle with pepper. Serve with sauce. Garnish with thyme, if desired. 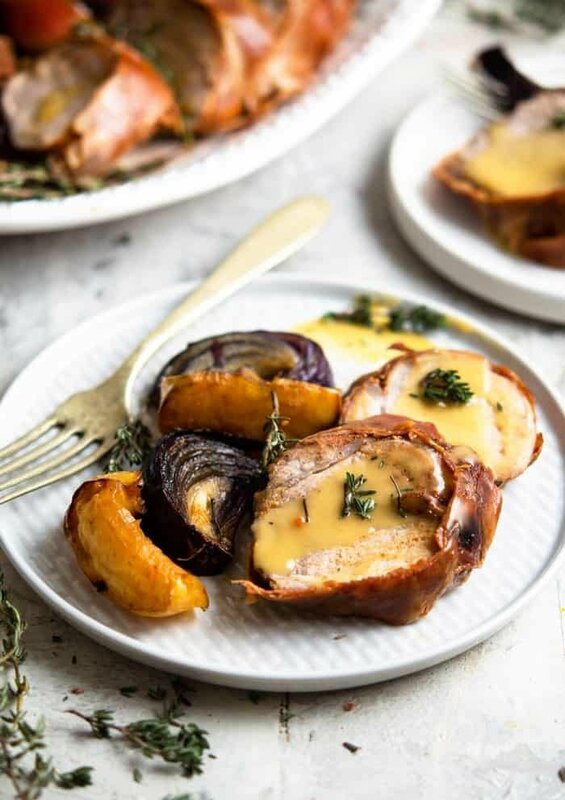 If you’ve tried this bacon wrapped pork tenderloin then don’t forget to rate the recipe and let me know how you got on in the comments below, I love hearing from you! 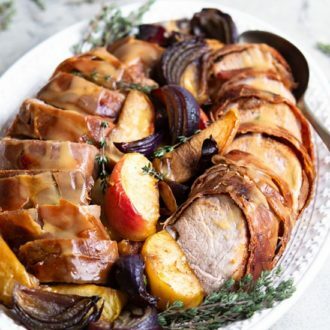 Succulent pork tenderloin wrapped in prosciutto or bacon and served with roasted apples, potatoes and caramelized onions. Preheat oven to 350F. In a small bowl, stir together salt, brown sugar, paprika, allspice, and orange zest. Sprinkle pork tenderloins evenly with spice mixture. Place four slices of prosciutto on a cutting board, overlapping slices slightly. Place one pork tenderloin in center of prosciutto slices; fold prosciutto up to wrap and cover tenderloin (prosciutto will stick to itself). Repeat with remaining tenderloin and prosciutto. If using bacon wrap tenderloin completely and use baking twine to secure if needed. Heat olive oil in a large skillet over medium high heat. Working one at a time, place wrapped tenderloins in skillet, seam side up. Sear until browned on all sides, 2 to 3 minutes per side. Place pork in a 13x9 baking dish. Sear apples and onions in skillet; transfer to baking dish. Bake until pork reaches desired degree of doneness, 25 to 30 minutes. Meanwhile, deglaze skillet with ¼ cup bourbon. Add ½ cup stock; whisk together remaining ½ cup stock and cornstarch. Whisk into mixture in skillet. Simmer until thickened, about 3 minutes. Stir in butter and remaining bourbon, if desired. Let pork stand 10 minutes; slice as desired, and sprinkle with pepper. Serve with sauce. 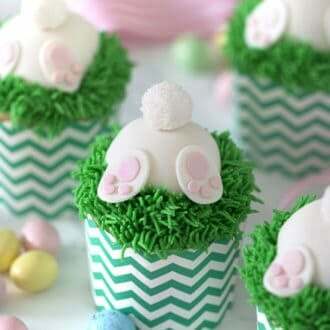 Garnish with thyme, if desired. You can use bacon or prosciutto to wrap the tenderloin in. 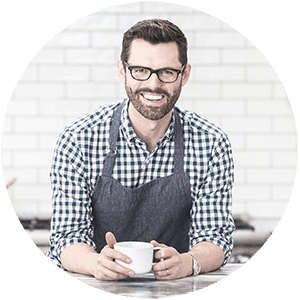 Bacon has a bolder flavor and more fat so it's really a matter of personal taste. 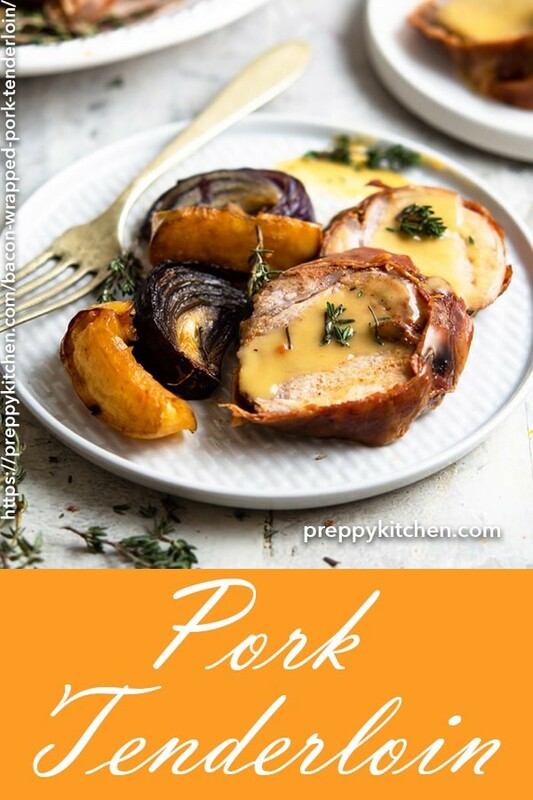 I don’t always eat pork but when I do, it will be this recipe from now on! LOL. The sauce is so amazing!